Tropico 6 Release Set for 2018 for PS4, Xbox One, and PC | Nerd Much? Tropico 6 is officially announced and confirmed to be coming in 2018, although there isn’t a specific release window just yet. The new debut trailer ends with a “rule again” title card and a release date of 2018. The game is to come on the PS4, Xbox One, and PC, as was the case for the previous games. Hopefully, the new entry will feel a bit fuller than the previous, as Tropico 5 felt like a barebones release that didn’t quite live up to our expectations. It seems to be “time to get back into the game” as El Presidente returns for another year of semi-democratic construction and management simulation. There is sure to be plenty of satire and poking fun at the current political climate; easy to do these days but no less hilarious when found in a game. Especially with the comment about a requested night off and getting two hours instead like it was some sort of philanthropic favor; there is surely a Tweet from the current US President stating something similar. In fact, we actually see El Presidente using “Spitter” in the PS4 reveal trailer (above), obviously taking a jab at our current president. At the end of the trailer, you can see the ruler flipping off a switch that says “El Presidente’s Crowd” — obviously another jab at #45. Hopefully, you can make your Tropico have a better ruler. Hopefully, we’ll get a good look at gameplay sooner rather than later, as Tropico 5 was definitely hit or miss. 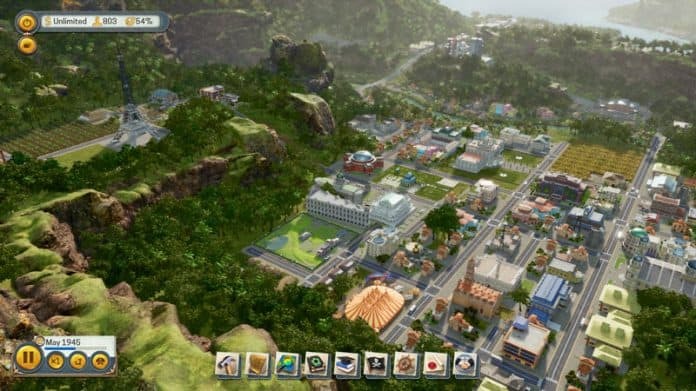 Tropico 6 certainly looks promising, and it couldn’t come at a better time for U.S. players. But while we wait for the official release date, check out all of the confirmed release dates in our handy 2018 Video Game Release Schedule, and you can also check out our most anticipated upcoming games of 2018 here.